Click “Allow” when your browser asks if you want to allow this page to open “Calendar”. You can choose to rename or select a custom color for your calendar, and change the auto-refresh frequency. We recommend “Every day” or “Every week”. Then click “OK”. The calendar will now show up in Calendar on your Mac. Also, if you have iCloud syncing enabled, it will also automatically show up on your iPhone, etc. 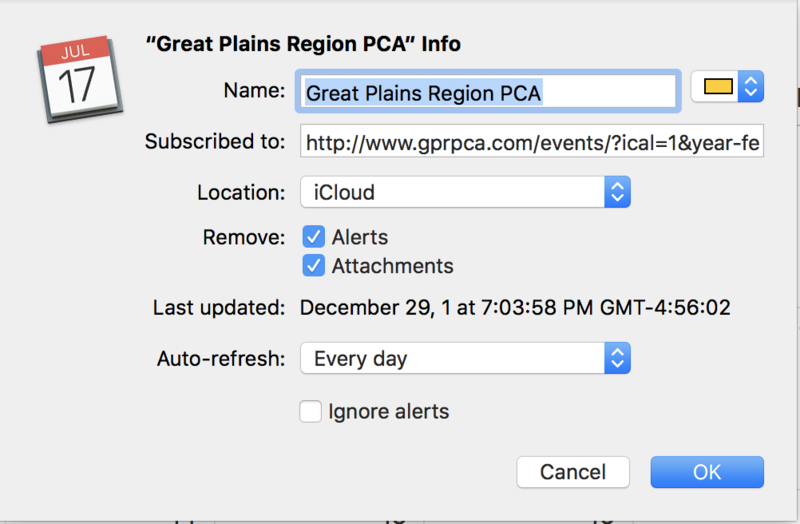 Tap “View Events” or “Done” when you see the message “The Calendar “Great Plains Region PCA” has been added”.